We didn't do much for Veteran's Day - mainly just stayed home cleaning up and making a big batch of lasagna (although it was 50% off day at the thrift store so we did stop in there that afternoon). Saturday was a different story. The Girl's school was having a PTCO garage sale - everything was 25 cents. Books, clothing, toys, movies, shoes, bags, etc. Everything. 25 cents each. We made it a point to get up and out of the house early to go. 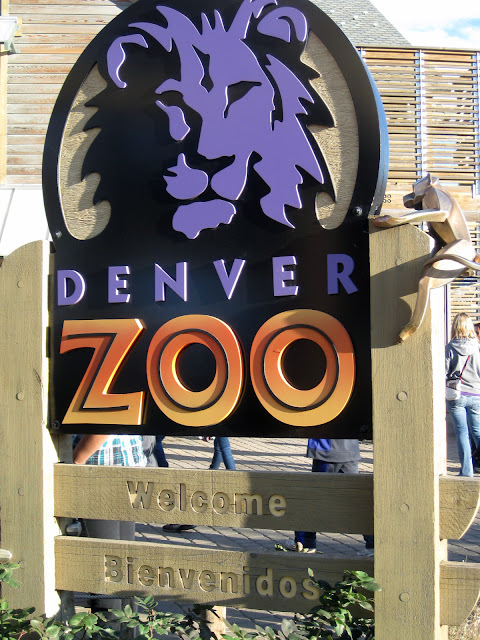 Saturday was also the last 2011 free admission day (no strings and no fine print) at the Denver Zoo. We had not yet been to the zoo and a free day seemed as good a time as any to go. As soon as we left the garage sale, we headed west toward the zoo. We knew when we were in the vicinity because cars were parked everywhere and crowds of people were all headed in the same direction - toward the main entrance. We drove through the parking lot several times (it reminded me of the scene in The Love Bug where cars are off course and crisscrossing through the mine) and finally headed off to park in the bottom most deck of the Denver Museum of Nature & Science underground parking deck and hike to the zoo entrance. Yes, it was THAT crowded. This was the first time the "Pickles" had ever been in a zoo other than the NC Zoological Park in Asheboro, North Carolina. 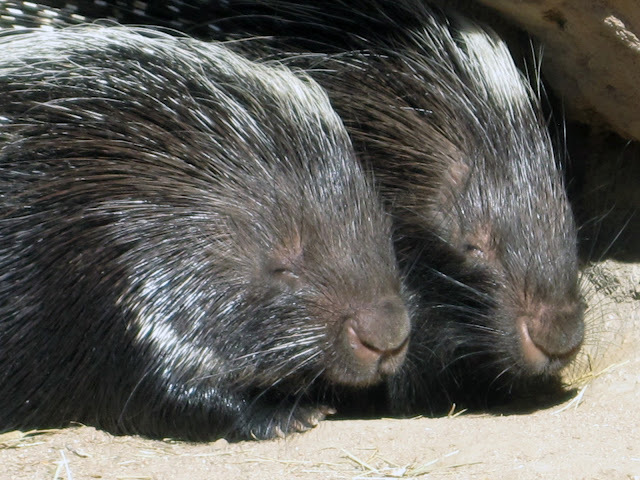 The NC Zoo is one of the nation's largest natural habitat zoos. 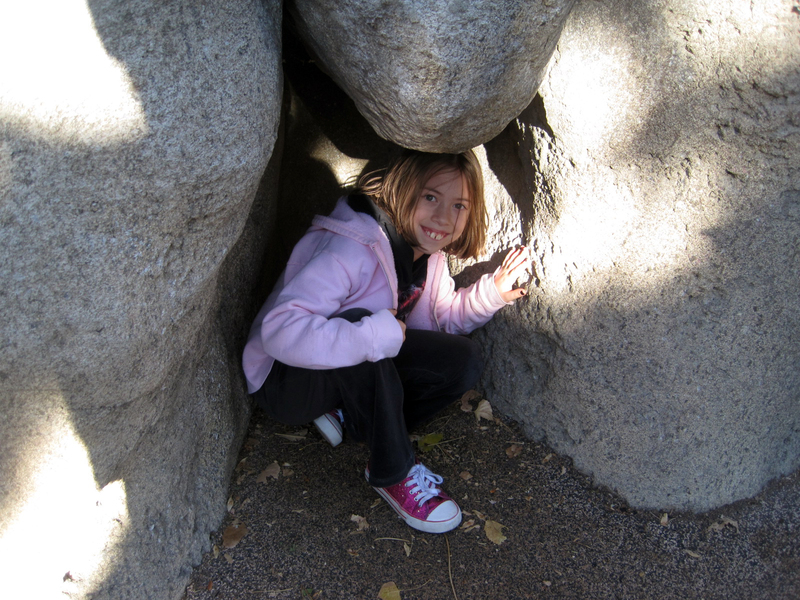 Sometimes it can be frustrating to spot some of the animals, but they have plenty of room to roam. We weren't sure what to expect at a "city zoo". Something similar to the zoos portrayed in Curious George books, perhaps? I found myself pleasantly surprised. While the exhibits were much smaller than those at the NC Zoo, they were much more "naturalized" than I had expected they might be. It was also much easier to see animals up close (or at least zoom in for a close-up photo). 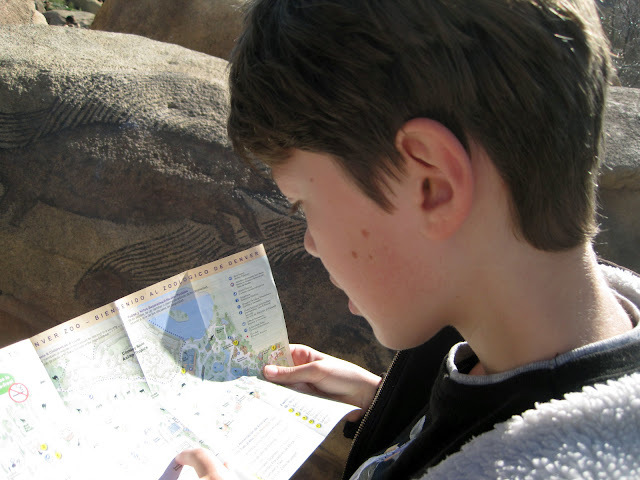 Once in the zoo, The Boy armed himself with a map and started "navigating" for us. He did a great job of keep us from getting lost. We just crisscrossed along the paths being as patient as possible with the crowds (did I mention it was crowded?). But hey, it was a gorgeous day and everyone there just wanted to have a good time. People seemed very polite with each other despite the crowded conditions. 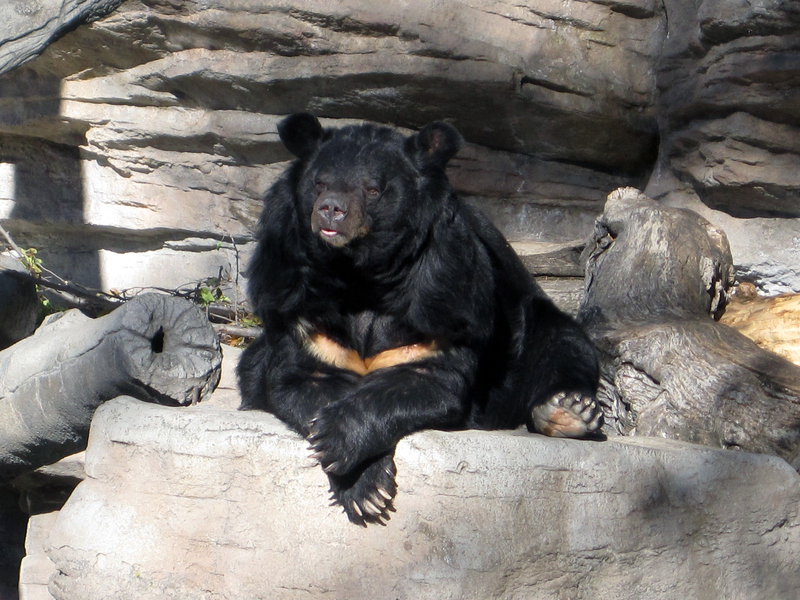 We were lucky enough to get to the bear exhibit right around feeding time, but even before the zookeeper came by with oranges for the bears they were sunning themselves and posing for the cameras. This guy (or girl?) is a professional! Understandably, one of the more popular exhibits, due to a fairly new addition (Hesty, born June 19, 2010), was the orangutan exhibit. We happened to be at the right place at the right time for that one...searching the outdoor exhibit just as mama and baby (followed by the crowd from indoors) stepped outside. What a cutie she was! We spent a good four hours at the zoo...at least. We took several packs of crackers and a couple bottles of water into the park. Restrooms and water fountains were plentiful. So were concession areas and restaurants but we didn't need any of those. Even with the large number of people there, we were still able to easily find a spot to rest for a bit and check the map. We all had a good time. Lots to see and plenty of exercise. Would we go again? Definitely. Would we go on another free admission day? Maybe if we took the bus or the light rail to avoid the parking...but I wouldn't mind visiting on a less crowded day.